﻿This is a first in a long time. I'm not entering this art journal page in any challenges. I did it just for me. It started with a junk mail ad of the chicken fried steak shaped Texas. Then I found an old encyclopedia that had these different icons of Texas. Oil wells, President Kennedy's assignation, the King Ranch, and Remember the Alamo. I was really pleased to find the picture of what the original Big Tex looked like because a few years ago he actually burned down and they are giving him a complete make over. If I can get over to the State Fair and take a picture of the new Big Tex I can add it to the page later. 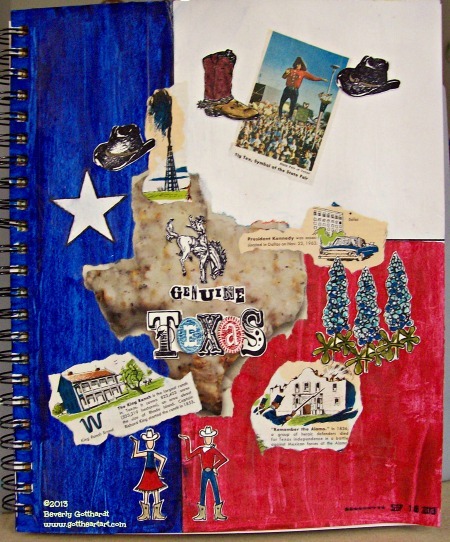 I painted the page like the Texas flag, I didn't want it to be to perfect so I scraped the paint on with an old gift card. A Stampin' Up star punch gave me just the right size Lone Star. I pulled out my box of Texas themed stamps and some watercolor paper. The bucking bronco which just had to sit on approximately Ft. Worth and the boot are Stampabilities stamps. The hats and the Genuine are Close To My Heart stamps, I'm not sure about the blue bonnet stamp, but the cowboy and cowgirl, and the Texas are Deadbeat Designs stamps. Texas is such a big state that there are many more interesting events that have occurred here and many more interesting places to visit. I'm a Texas girl born and basically raised here. After my Dad retired from the Air Force we retired in Fort Worth and have lived here since 1964. My husband's family is from the New Braunfels area, so I married a Texas man. Our family agrees with the slogan: The Great State of Texas!